So you read Prescription Opioids 101 to learn how to identify what’s in your medicine cabinet, and are hopefully now trying to figure out how to dispose of your unused or expired medications. According to the 2015 National Survey on Drug Use and Health, the majority of abused prescription drugs are obtained from family and friends – often from the home medicine cabinet. By getting rid of prescriptions you no longer need, you help prevent the spread of drug addiction and the potential of unnecessary overdose deaths. Solution #1: National Prescription Drug Take-Back Day is October 27th. The next national Take-Back Day is coming up October, but that doesn’t mean you need to wait until then. To find a location near you before then, visit the DEA’s site search page and enter your zip code or county, city, and state for the location nearest you. 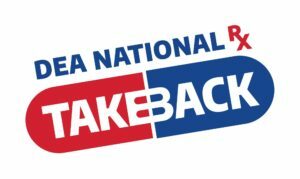 In April, the DEA collected unused, unwanted or expired prescription medications at close to 6,000 sites across the country. The 2018 April Take-Back Day netted close to one million pounds — nearly 475 tons — of prescription drugs. That means since the program first started in 2010, the total amount of prescription drugs collected by DEA is nearly 10 million pounds of prescription drugs. Returning your unwanted medicines to a take-back program is the safest and most environmentally-friendly way to dispose of unused medication. Solution #2: Find an Authorized Collector in your Community. DEA’s site search page will help you find an authorized collector in your community. Many pharmacies offer this service at no charge – not just on Take-Back Day. Speaking of pharmacies, CVS offers a community donation program where local police departments can apply to receive a drug collection unit to help their communities safely dispose of unwanted medications, including controlled substances. For other medications, some pharmacies and online retailers also sell postage-paid envelopes for customers to mail any prescription, including expired or over-the-counter medications to a disposal facility. It’s worth noting that mail-in programs do not include medications that are a controlled substance. This is the least preferable solution, but if you don’t have access to a prescription drug take-back program in your area, follow these steps to get rid of the drugs in the household trash. Remove the medicine from its original container and mix it with an undesirable substance, such as used coffee grounds, sawdust, or kitty litter. Place the mixture in a sealable bag, empty bag, or other container to prevent medicine from leaking or breaking out of a garbage bag. Before throwing away the empty Rx container, scratch out or tear off any identifying information on the exterior. This protects your identity as well as your personal health information. Do not flush medicines down the sink or toilet unless the prescription drug labeling or patient information that accompanied the medicine specifically instructs you to do so. Many communities prohibit this practice out of concern over the trace levels of drug residues found in rivers, lakes, and community drinking water supplies. *References to any retailer do not imply endorsement by S.A.F.E. Project.